Crist’s post about this fascinating National Geographic article last week touched on its excellent graphics but barely began to scratch the surface of the amazing technology that would certainly have left the readers of the early issues of the magazine speechless. A 26-foot-long frieze in the city-state of Holmul depicts a complex religious scene with an inscription that suggests close ties with the Snake dynasty. 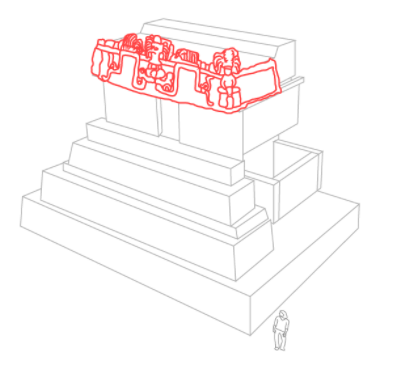 The central figure is the Holmul king who died around 590 and was buried in the tomb the frieze adorns. Maneuvering in the close confines of an excavated tunnel, scientists used a 3-D scanner to acquire precise measurements and produce this detailed digital replica. And to connect the technological and archaeological dots to my recent toe-testing into the “art of the dig”, Archaeologist and Photographer Mark Willis used these same applications to digitally exhibit the artifact below. The Late Classic period, (ca. AD 750 to 800) ceramic head was excavated within the Norman’s Temple courtyard during the 2016 Chan Chich Archaeology Project field season. Final note, how cool is that! ?